It’s always an early start for the crew on Australia Day. Luckily the Apex BBQ is up and running by 6.30 am to get us off to a good start. The Runners Club Fun Run is in in full swing by 7.30 and it really just heats up from there, with the joyous Australia Day Citizenship Ceremony and lots of action around the square. This year there was the usual side show alley, some great food trucks, markets, Bush Tucker tastings great entertainment on main stage, and of course it would not be Australia Day without fireworks. 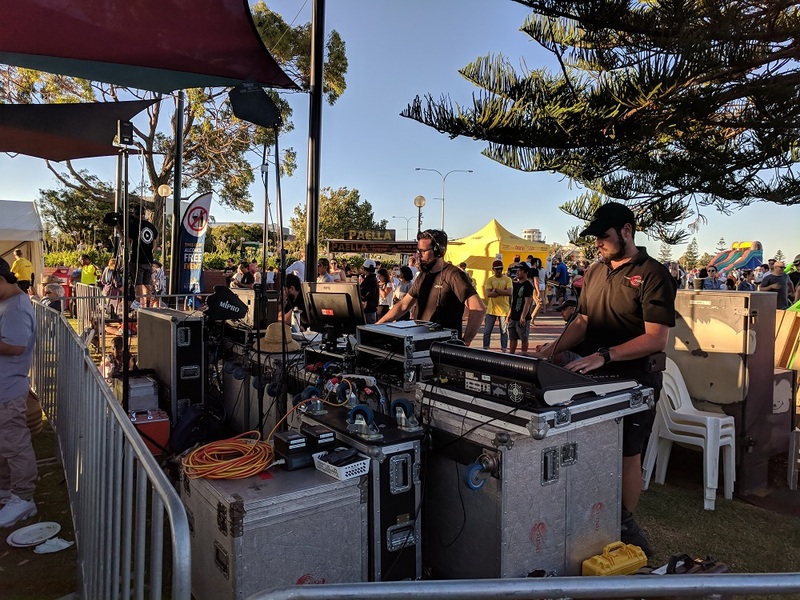 The City of Bunbury provided plenty for the kids to do with water slides, high ropes, rock climbing, bouncy castles and rides and a dedicated Kids Stage. Walter and the crew built the Southern Cross backdrop for main stage. Jared Ross on lights. James Newhouse at FOH. Derek on monitors, Dean, Sharon & Jeff from Lomax Media on image mag. The crowd seemed to really enjoy the entertainment provided by Bunbury Entertainment Agency included Grace Armstrong, Howie Morgan, Wooley Mamoth, Aviida. National Anthem by the lovely Bonny Twigg. Aviida helped the crowd to find their voice and got them up onto their feet in the lead up to the fireworks.